The title comes from “The Rime of the Ancient Mariner” by Coleridge, and it’s appropriate in every way. In this case, the mariner is The Traveller, who is indeed ancient, crossing the seas on the former slave galley “Seeker”, propelled by magic and driven to search for the only woman he has ever loved. The Traveller (he has no other name) is an old man, looking back on his life on the eve of his final battle, his last reckoning with the Demon Queen who has enslaved a continent. How he came to be immortal, how he lost the girl who meant everything to him, how he came to be leading an army half a world away from the village of his birth; these scenes are explored in interrupted dreams and memories. The Traveller assesses his own long life, while the preparations for battle in the uncertain hours before dawn drag him constantly back to the present, to the threatening presence of the Demon Queen that overshadows everything he does. This is an elegant novel, poetically written, with just the right mix of pathos and humour, and the Traveller’s ability to mock himself ensures it never spills over into mawkish sentiment. The twist at the end might be a little too obvious, but it’s still clever, and the immortal Traveller’s eventual showdown with the Demon Queen is as painful to witness as it is satisfying. The supporting cast of characters are well-drawn, but the Traveller rightfully dominates the story. Maybe he owes something of a debt to Doctor Who, maybe something to Earthsea’s Ged, but he’s a force of nature in his own right. Nyki Blatchley has been writing about the Traveller in short stories for years, but this is the first published novel. There’s plenty of scope, all kinds of back and side stories hinted at but never fully explored, for this to expand into a series. After all, if a man’s going to live forever, roaming the seas, unencumbered by albatrosses, he’s bound to have enough adventures to fill a few books! 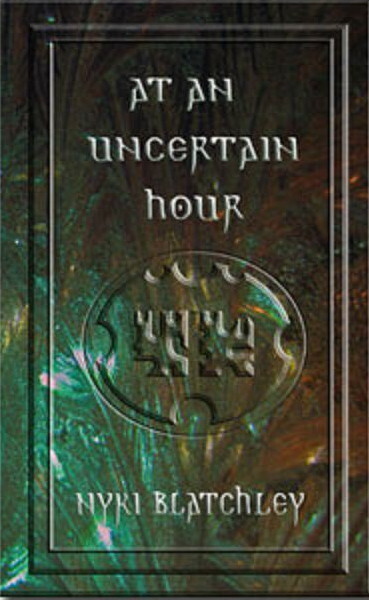 “At an Uncertain Hour” is an exhilarating opening.